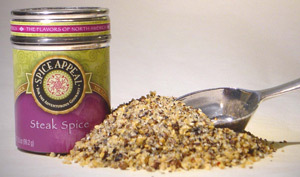 Sprinkle or rub directly on steak and chops to accent the natural flavor of the meat before grilling or broiling. Mix 4 tsp steak spice with 1/4 cup olive oil and 1/4 cup soy sauce for a wonderful sirloin marinade. Add to seafood, steamed vegetables, or egg dishes for that extra zesty flavor.